Activate your personal "Einstein Factor" - that secret trigger for ingenious thought that lies within you - and unleash the limitless power of your mind! In just a minute, you'll learn how this easy, 10-minute exercise, called Image Streaming, can be the secret trigger that unlocks your highest levels of genius. You see, Albert Einstein used Image Streaming. In fact, he said it was the key to his unprecedented discoveries. But it wasn't until researchers studied sections of his brain for several decades that we discovered how Image Streaming can radically and permanently increase the intelligence of anyone who practices it. If this easy exercise caused you to make full use of the 90% of the brain most people don't use, that would make you 1,000% better, or ten times more effective, than you would be using only 10% of your mind. Learning becomes a walk in the park. You are able to learn everything there is to know about the subject of your choice in a short amount of time. When you think of a subject, career, or discipline you want to be better at, you imagine yourself absorbing everything you need to know in only a few short months. You experience great success in the situations that matter most to you. As a genius, you easily outpace, outmaneuver, and outwit any competitor with ordinary learning abilities. You always have relevant facts, figures, and information at your fingertips. Plus, you have access to a wellspring of creative ideas and intuitions that prove invaluable to employers and clients. If you wanted to, you could easily change careers without any inconvenience. You realize that you can quickly develop hands-on knowledge in the area of your choice. And that makes you feel good, knowing you are using your talents more effectively than you ever have in the past. These are just a few of the side effects of genius. So let me ask you again: If you could experience all those things by doing nothing other than a simple, relaxing exercise for a few minutes each day, would you do it? The only way your answer could be "no" is if you really didn't believe the exercise could make you a genius. However, Einstein showed us otherwise. In fact, he attributed his scientific prowess to what he called "vague play" with "signs," "images," and other elements both "visual" and "muscular." "This combinatory play," Einstein wrote, "seems to be the essential feature in productive thought." In other words, he spent a lot of time perfecting a type of daydreaming that allowed him to make his profound discoveries. When he practiced what we now call Image Streaming (a method I'll discuss in a minute), an entirely new world of discovery opened up to him. That world of discovery can open up to you, as well, and as Einstein's early life shows, it doesn't matter whether other people think you're smart or not. You still have access to the highest levels of genius. Early in life, Einstein seemed like a below-average child with nothing other than a dead-end future ahead of him. He had problems learning to speak and read, and until he was seven, he repeated every sentence he said back to himself softly, moving his lips. Because of his poor language skills, his Greek teacher told him he would never amount to anything. He was later expelled from high school and flunked his college entrance exam. After finally getting into college and earning his degree, he failed to get an academic appointment or a recommendation from any of his professors. So he was forced to accept a humble job in the Swiss patent office. He seemed destined for a life of mediocrity. Yet a few years later, when he was 25, Einstein published his Special Theory of Relativity in the summer of 1905. It contained his famous formula, E = mc2. Sixteen years later, he had won a Nobel prize and become an international celebrity. Decades after his death in 1955, the image of Einstein - with his mysterious eyes, bushy mustache, and silvery hair - is still the classic image of "genius." His name is a synonym for supernormal intelligence. What Did Einstein Have That We Don't? chunks of it to other researchers upon request. Unfortunately, he never discovered anything significant. But one of his colleagues did. Develop a flawless memory by using your subconscious mind to absorb everything in your environment. Read dozens of pages a minute with better comprehension than you would get at regular speed. Learn and absorb new and challenging information with ease. Effortlessly solve problems by creating an environment that allows the answers to pop into your head from out of nowhere. Score higher on tests and increase your IQ level permanently. Access powerful subconscious insights through visualization. Induce a state of total creative absorption. Be perceived as brilliant by others and permanently boost your self-esteem. Most people assume geniuses are born, not made. But Dr. Marian Diamond of the University of California at Berkeley, proved otherwise. In one famous experiment, Diamond placed rats in a super-stimulating environment, complete with swings, ladders, treadmills, and toys of all kinds. Other rats were confined to empty cages. The rats in the stimulating environment lived three years (the equivalent of 90 in a human) and their brains increased in size, sprouting webs of new connections between nerve cells. In contrast, the rats that lived in empty cages died younger and their brains had fewer connections. When Diamond examined Einstein's brain, she found an increased number of connections between nerve cells, just as she expected. This suggested that the nerve cell enrichment process was similar in humans to what it was in rats. What this means is that if Einstein's brain worked like Diamond's rats' brains, then it may be possible to create new Einsteins by creating an environment in which nerve cell connections grow. So what did people like Einstein do to stimulate nerve cell growth and access the inherent genius of their minds? Mind development pioneer Dr. 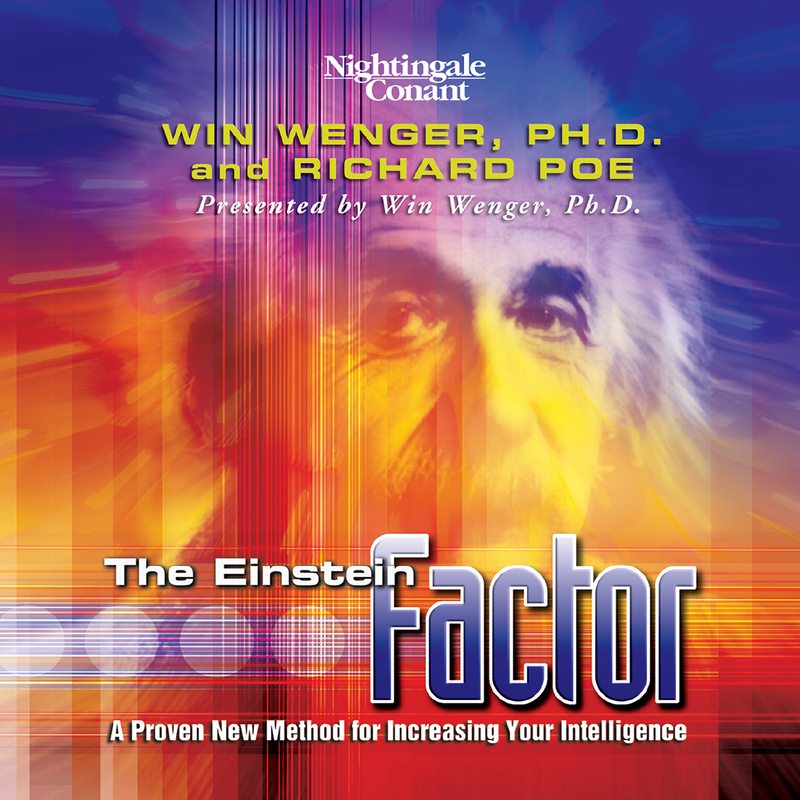 Win Wenger and Richard Poe, co-authors of The Einstein Factor, noticed a clear pattern. They found that geniuses such as Einstein, Tesla, Edison, and da Vinci were little more than ordinary people who stumbled upon some knack or technique for widening their channels of attention. This helped them make their unconscious perceptions conscious. Geniuses usually develop this knack so early in life that they completely forget the secret by the time they grow up. Because of this, they are usually as confused as the rest of us when it comes to explaining how they managed to achieve such extraordinary results. However, in Einstein's case, he stumbled upon his knack near adulthood, and so he was able to tell us about it. Einstein himself believed that you could stimulate ingenious thought by letting go of inhibitions and gaining access to your inner perception - the constant flow of images that are passing through your mind. But he never revealed exactly how to do that. Fortunately, over the past 30 years, Dr. Wenger, co-author and presentor of The Einstein Factor, found Image Streaming to be the answer. This technique opens the mind to a flow of symbolic imagery as potent as that of any dreams, but unlike dreaming, you can practice Image Streaming while you're wide awake. You can also do it any time or anywhere you want. In fact, ten minutes of Image Streaming a day will induce profound positive changes in your life. Psychologists estimate that we spend 50 percent of our time daydreaming and over eight percent of it sleep dreaming. That means we spend 58 percent of our lives absorbed in passive reception of subconscious imagery. It sounds like a lot, but in fact those figures are a gross underestimate. New estimates suggest that image streaming never ceases. By learning to access the images that are constantly passing through our minds, we can imitate the same mental practices used by Einstein, Tesla, Edison, da Vinci, and many other geniuses to come up with breakthroughs in knowledge. You are smarter than you think. In fact, your subconscious holds the same mental powers as some of the greatest minds in history! New scientific research suggests that the superior achievements of famous thinkers may have been more the result of mental conditioning than genetic superiority. Now, with this audio program entitled The Einstein Factor: A Proven New Method for Increasing Your Intelligence, Wenger shows you how you can learn to condition your mind in the same way. Once you unleash the genius within you, you will improve your performance in virtually all aspects of mental ability, including memory, quickness, IQ, and learning capacity. Dr. Wenger will give you a breakthrough set of tools that will allow you to raise your intelligence, concentration, and insight to much higher levels. Using the Image Streaming technique, you'll bypass inhibitions and access the powerful capabilities of your mind which has virtually unlimited potential. Mind development today is just starting to advance to the point where anyone can improve his or her intelligence permanently. Several recent programs have proven that IQ levels can be raised. The challenge has been to keep them raised. The Einstein Factor overcomes this challenge. By following the simple exercises in the program, your intelligence gains will stay with you for the rest of your life! Your own personal Einstein Factor is that secret trigger for ingenious thought that lies within you. Innovations covered in the program such as Image Streaming, Photo Reading, Free Noting, and Borrowed Genius will help you pull that trigger. As a whole, these processes will do much more than raise your IQ. They contribute to a more important goal - elevating your overall brain power and enhancing memory, creativity, reading speed, specific talents, and general brain health. In The Einstein Factor, you will liberate mental abilities you didn't know you had. When you try the techniques, they will pay off almost instantly! P.S. Just ten minutes a day Image Streaming can make you a genius! It's the easiest, most fun, and most relaxing intelligence-booster I've ever experienced, and it's based on the ingenious thought processes of Einstein and the other greatest minds in history! I want to activate my secret genius trigger and experience a mega-jolt in brainpower!